The Dread Crown Regent then closed the final court of the reign. She then opened the first court of her Regency. 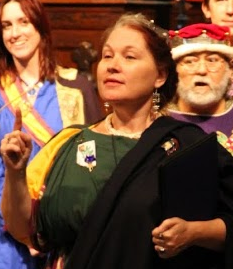 Crown Regent Mercedes then proceeded to lead the populace in a traditional Ostgardian antiphonal. At the conclusion thereof she did summon forth and crown Their Highnesses Brennan and Caoilfhionn as Brennan Rhi, and Caoilfhionn Banri, 96th King and Queen of the East, thus ending her Regency. This page was last edited on 1 April 2019, at 13:30.